As the Jackson Five spelled it out years ago—love is as easy as 1, 2, 3 and as simple as A, B, C. Deciding on a date night or weekend getaway may be a little tougher. Using the classic song as inspiration, read on for an alphabet’s worth of tips and ideas on how to spend time in Greater Madison with your loved one. A romantic date night starts with the right restaurant serving amazing cuisine with a side of romantic ambiance. Madison’s culinary scene is adored by food critics and magazines, including Time Out Chicago, who ranked Madison as a “road trip for food-lovers.” From nostalgic supper clubs to trendy bistros, Madison’s foodie scene will have your sweetie smitten! Share the experience of handcrafted chocolate—you’ll be in for a real treat! Gail Ambrosius Chocolatier in the Atwood neighborhood specializes in single-origin dark chocolates, while Candinas Chocolatier in the heart of downtown imparts superior blends of rich flavors. Check out our Sweet Treats page for more sweet goodness like pie, cake and other desserts! Take a tour of the city with your loved one at your side, and see the sights and sounds that encompass Madison’s charming character. Madison Eats explores the area’s best eateries and Madison City Tours showcase the city’s ethnic roots and history. For a complete listing of the area’s tours, visit our Food Events and Tours page. Essential Madison Experiences are your ticket to unforgettable adventures. Make memories together as you go hands-on with iconic Madison attractions. Savor spirits and culinary crafts, and explore like never before. Share these unique experiences to get closer than ever. Stroll through 16 acres of outdoor gardens and the indoor Bolz Conservatory on your next date at Olbrich Botanical Gardens. Smell the roses, feast your eyes on exotic flowers, or sit side-by-side while gazing at the beautiful Thai Pavilion. Another option for nature lovers is the UW-Madison Arboretum, the birthplace of ecological restoration (and many marriage proposals!). There are many walking trails, from wide and level paths to hilly trails. Looking for a special gift for your loved one? Why not try Madison’s State Street, a pedestrian mall home to many local, boutique shops like Little Luxuries, which sells one-of-a-kind, unique gifts. Monroe Street also has many specialty stores like Orange Tree Imports, voted “Best of Madison” for more than 20 years. Read about our shopping centers, antique shops and more on our Shopping page. Need an excuse to get closer? Why not visit Cave of the Mounds, a dark and mysterious cave that may require some hand holding to navigate. This national landmark also hosts Fridays After Dark, a new series of themed events for those over 21. Each event includes a unique in-cave experience and a theme-related reception with a cash bar. Impress your date with your sophisticated knowledge of art, the Chazen Museum of Art is worth your time. In fact, the museum created this quiz to see how you’d fare on a stroll through their museum. If you score high, you’re ready for a night of impressionism at the Chazen! Rubbing the nose of the honey badger statue at the entrance to the Supreme Court at the Capitol Building is considered good luck. Why not take it a step further and steal a kiss from your sweetie while touring the building? Experience the beauty and grandeur of Wisconsin’s Capitol building together with a free tour. The building, especially the scenic observation desk, is surprising romantic. Our five lakes aren’t reserved just for summer. Many enjoy ice skating, ice fishing, snow kiting and other sports when the temperature drops. You can spend the whole day on Madison’s lakes—whether you’re looking for a sunset cruise with Betty Lou Cruises, or want to relax on one of Madison’s dozen beaches. Turn the romance up a notch with a sun-filled, relaxing day on our lakes! Romance comes naturally with a candlelit moonlight snowshoe throughout the trails of the Aldo Leopold Foundation. Hundreds of candles softly glow as you walk, plus you can snuggle up by a roaring bonfire afterwards. Even if you’re not in town during one of these moonlight walks, the center serves as a real treasure of natural beauty year-round. Next time you visit Madison, consider a charming bed and breakfast. Located in the heart of downtown, The Livingston Inn was built in 1854 and was home to two Madison mayors. The Buckingham Inn is Madison’s newest B&B and a classically-restored 1911 residence located just steps away from the UW-Madison campus. These B&Bs and others are the perfect starting point for any romantic stay and booking a room is easy! For a quick and affordable date, a slice of Ian&apos;s is a must! Stop by before or after a show, or in-between State Street activities for a variety of fun slices - including the iconic Mac & Cheese! Grab a flight or two and taste your way through the menu at one of our many breweries, distilleries or wineries. Use our itinerary to plan a mini tour of the town! Madisonians love the color red. For many, it exemplifies their one true love: the Wisconsin Badgers. Cheer on the home team the next time you’re in Madison and you’ll fall in love, too! Badger fans are loyal, and it’s almost as fun to watch them as it is the sports teams. Plus, with many pre- and post-game options, you’re bound to have fun at USA’s Today’s top pick for best college football town. When traveling, it’s exhilarating to find those hole-in-the-wall restaurants and secret hang-outs reserved for locals. 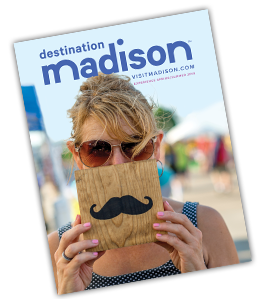 Impress your travel companion by reading our like a local itinerary, which will give you the insider scoop on the places and things that create Madison’s unique culture. Sure, it may be cliché to take your spouse for a day at the spa, but you’ll still win brownie points! Share a tender moment during a couple’s massage at one of Madison’s many spas and discover why Madison ranks among the best in the nation for quality of life. If you have an undying love for movies, discover Madison’s theaters, which are home to much more than popcorn and soda. The Take Five Lounge at Marcus Point Cinema has dream loungers that provide maximum comfort and closeness, and AMC Dine-In offers a restaurant and movie theater rolled into one. Both theaters allow you to choose your seats when you purchase your tickets. Take your funny valentine to one of Madison’s comedy shows and give the gift of laughter! Ranked as one of TripAdvisor&apos;s top nightlife attractions in Madison, the Monkey Business Institute improv shows create comedy by infusing audience suggestions. Another funny option is the Atlas Improv Company, voted “Best Comedy Group in Madison” by Madison Magazine. If you’re searching for a non-traditional, wild way to spend the evening, catch a Madison Roller Derby bout. This fast-paced experience combines adrenaline and estrogen, sass and strength for a thrilling performance. …for more information? Check out the events calendar—searchable by category, date and location. Or visit the Things to Do page, chalk full of itineraries, free attraction ideas and more. Sign up for our Madison enewsletter to get updates on what&apos;s happening in and around Madison. A stroll through Henry Vilas Zoo – one of the few free zoos in the U.S. is a perfect date anytime of year. During the holidays, visit in the evening to experience Zoo Lights. Stop and pose for a photo with the giant polar bear statue!